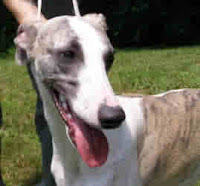 Yesterday was October 18th and my 3 year old boy Steeler was to be shipped from Philadelphia Int'l Airport to Frankfurt, Germany to his new home at "of Gentle Mind" Whippets. I asked a friend of mine, Gloria, if she'd like to take a ride to the airport with me. Steeler's flight was sceduled for 6:00 pm but I had to have him there by 3:00 pm. I stopped at Gloria's house to pick her up, had a short "beverage" and we started our journey around 12:30 down the turnpike, for our 1-1/2 hour drive. We left a bit early only cause you never know if there is an accident on the turnpike, you can sit for hours. It was a bit scary though when the Lufthansa Cargo place called me on the cell about what time we were going to be there to ship our CAT. This gave me a bit of cause for concern, but we got it straight that Steeler was indeed a dog, not a cat. This cause for concern made us need another "beverage". Our actual directions didn't take you to the airport in Philly, but to a business park in Folcroft, which is just outside of Philly. Now being I don't have a GPS, I used Mapquest, and they have never failed to get me to where I needed to go. More than a few times we looked at each other wondering where in the hell we were going, but I kept saying Mapquest always gets me there. We followed the directions explicitly and eventually did make it to the business park by about 2:15 pm. Feeling good about being early, we searched for Lufthansa Cargo. We searched and we searched and we searched. We even called Lufthansa and they said they were off a different road than they had origionally told me. Panic set in as the time ticked down. If Steeler wasn't at the Lufthansa Cargo area by 3:00 pm, he would be sent home and we'd need to reschedule his flight. Time went on, 2:30 pm, we stopped at a small roadside Crab Shack and it just so happened the nice man was talking to his significant other on the phone and she was home and it just so happened that she was on the computer and on mapquest. What a break. I gave her the new address the Lufthansa lady told me, and she told me exactly where I needed to go. We thanked the man profusely and off we went. We got right to where we needed to go and were looking for building 48 (they really don't have any signs of what these businesses are). It's now 2:40 and time is ticking. Saturdays, the business park is like a ghost town with no physical activity what-so-ever, so stopping to ask directions was non-existant. We were driving in a deserted business park, or so we thought. Time: 2:45 pm, we saw a guy walking and asked him where the Lufthansa Cargo area was, and we were right behind it, but how did you get inside, is there an office? He said we needed to go around the building and it was right there. Time: 2:50 pm. We drive around the building and wa-la, there is the office door. Now being we drank all those "beverages", we needed to visit the little girls room badly, so my plan was to go immediately upon arriving at the Cargo office. NOT, time now 2:55 pm and paperwork needed to be done, dog & crated needed to be weighed BEFORE 3:00 pm. I gave them all the paperwork, and ran to the bathroom, ran outside to get Steeler and his crate, Gloria walked Steeler quickly and I took the crate inside. We got him weighed in and the paperwork done by 3:00 pm, just by the skin of our teeth. With a tear in my eye, I gave Steeler a big hug, told him I loved him and although I would never see him again, I'd always think about him. And he needed to be a good boy for his new owners Joachim and Werner. I left Steeler at 3:10 pm and haven't heard yet if he arrived in Germany. His flight is scheduled to land at 8:15 am this morning, but I'm thinking he may have already landed because of the time change. I'm a nervous wreck not knowing if he's there safely or not. I'm sure he's fine wherever he is, but I'll worry till I know for sure.